A lot has happened since my last post in terms of the overall exhibition. Now that a substantial amount of the research has been completed by my fellow classmates and myself, it has become time to consider how we are going to display the books within the exhibition space in a way that is beneficial and convenient to you all, our audience. This is not an easy process as the construction of an exhibition must consider many different elements in order to be successful. In this blog post, I would like to explain to you the things that our class must think about in order to successfully compose this exhibition giving our audience the best overall experience. Just as we are discovering what goes on behind the scenes in the construction of an exhibition, it is important that you all have a better understanding of why we are displaying the books certain ways or are thematically placing them together. One factor in particular that we have been grappling with is the orientation of the cases within our exhibition space. It is important that we orient the cases in a way that is both easily navigable for our visitors as well as displays the fore-edge painted books in a manner that is easily viewable. For example, if the cases were to be placed up against the wall, it would be restrictive on the viewer. People would not easily be able to see the books on display in the rear of the cases forcing them to potentially lean on the cases to peer over the books. This is something to consider as it is not the most attractive and convenient way for visitors to view the books. Similarly, if the cases cannot be displayed in an orientation that is restrictive to the overall flow of movement throughout the space. If the cases are not oriented successfully things like bottlenecks can occur when viewing the books and the space can become crowded. 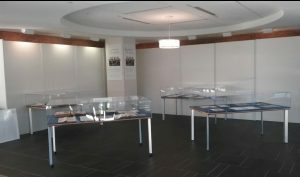 Mock of exhibition layout in future exhibition space. Another factor to consider in this exhibition is the way in which we want to display the books themselves within the cases. One thing that the class has been discussing is themes. By dedicating a theme to each of the cases, we can unite the books on display in a unique way, therefore bringing them further meaning. Overall, one of the main goals of this exhibition is to educate our audience on the history of fore-edge painted books as well as how Loyola was able to acquire them. These are both things we must consider when determining the themes that we are going to incorporate into the space, as it is necessary for them to reflect and reinforce the goals of the exhibition. Finally, fore-edge painted books are unique in the way that one is able to view the painting. Therefore, when it comes to displaying them, we must construct specialized cradles. These cradles not only display the books in a way that provides the best overall view of the painting, but they also support the books. These books are old and very fragile. The cradles prevent the spines from being too stressed and therefore help preserve the books. All these things must be taken into consideration. I hope that this post was informative and gave you a little bit of insight into our thought process on the exhibition. Until next time!